The maker of the “greenest car” of 2014 has so much to offer to other electric vehicles as well. Presently, a BMW i patented technology powers its new e-bike. A recent press release by BMW Group announced that the inventive drive unit swing arm is going into production at the pedelec factory HNF Heisenberg. BMW has a longstanding reputation for visionary work, purposeful pioneering. The press release emphasizes the “progressive design and a new understanding of premium that is strongly defined by sustainability.” The release describes BMW i as an incubator within the BMW Group reaching far beyond the BMW i3 and BMW i8 vehicles that we already know. The patent for a drive unit swing arm originates from the first stage of BMW i market research and the early concept phase. BMW Research and Technology furthered development to series maturity. Continuing, the press release reports, “As there was no longer any immediate use for the patent due to the focus at BMW i on two-track electric vehicles, it has now been finally released for external usage.” A bicyclist can utilize its manifestation on the e-bike “Heisenberg XF1.” The concept bike by BMW i shows the origin of technological innovation via a small BMW i logo. An original, the drive unit swing arm is a fresh frame technology for full-suspension e-bikes featuring a mid-motor. BMW explains that the idea permits the drivetrain, previously firmly attached to the main frame, to float freely. Thus, it eliminates the need for the conventional chain tensioner. 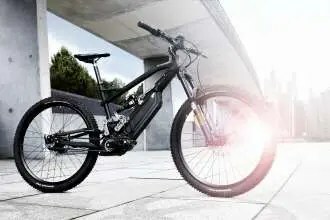 Permitting for the first time the combination of a rear suspension and the long-lasting, maintenance-free carbon belt drive on full-suspension e-bikes, it reportedly creates outstanding propulsion and handling characteristics. The HNF Heisenberg development team designed the new suspension technology for the XF1 in a very specific way. The kinematics are fully integrated above the mid-motor, connecting it securely to the frame. To ensure consistent spacing of the low-maintenance carbon drive belt between the spindle and the rear hub, the mid-motor, and rear hub are integrated into the drive unit swing arm. The belt runs under tension and perfectly aligned between both toothed belt discs enabling an effortless transfer even high peak loads from the mid-motor…. 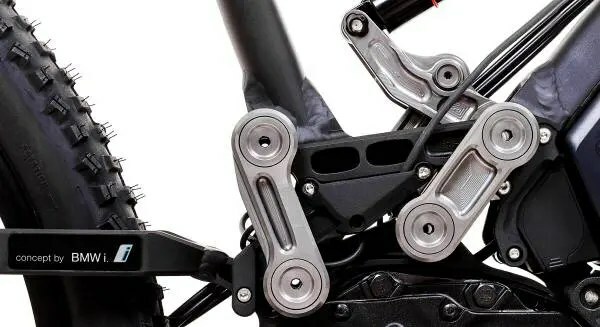 One of the dynamic and related advantages of the drive unit swing arm is the fact that it functions without recoil from the pedal.Compared with other rear-mounted suspension concepts, which are specifically optimized for muscle-powered drive systems, there is no stiffening of the rear swing arm when the electric motor is providing a high degree of assistance such as during acceleration, constant travel at high speeds or on hills. The suspension can respond sensitively at any time, ensuring excellent grip and high traction. As the proportion of human driving force is relatively small, there is no unpleasant rocking movement when accelerating or breaking. Even in the event of extremely uneven terrain it is possible to pedal smoothly and efficiently.